Dubai: A multinational choir from Dubai will perform with Grammy-winning composer and conductor Eric Whitacre at one of the world’s most prestigious concert halls in New York on Sunday. The Dubai Chamber Choir has been chosen to sing original and new music of the famous Whitacre along with other international choirs from other countries at the legendary Carnegie Hall. Called ‘The Music of Eric Whitacre’, the concert will also feature The Phantom of the Opera singer Sara Jean Ford and sought-after pianist Kelly Yu-Chieh Lin. 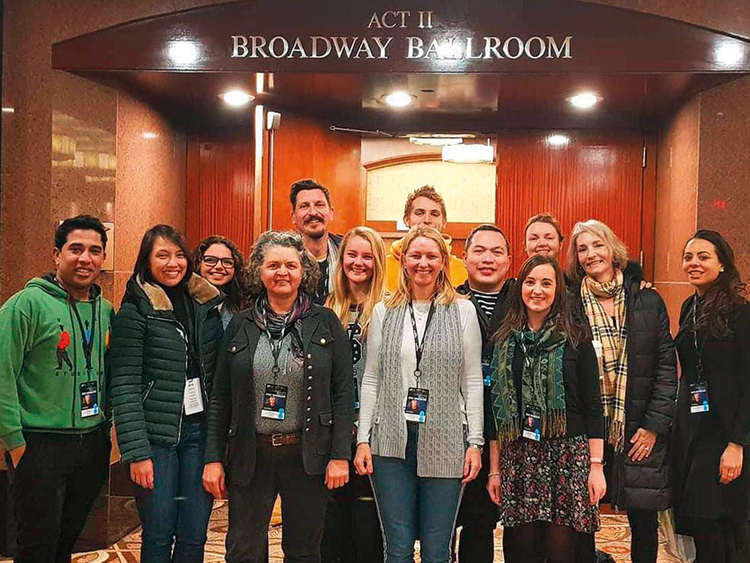 Some 14 Dubai Chamber Choir members of different professions from the US, the UK, Kenya, the Philippines, India and Canada have flown to New York for the concert. The group includes three high school students — Charlotte Dixon, Finn Page and Habiba Al Khatib who stepped in at the last minute to replace other members who had to drop out. “On this occasion, we will be singing the music of Eric Whitacre with the composer himself conducting. We get to work with him for a weekend of rehearsing before the concert on Sunday. This is a huge accolade and a bucket list item for every member of the choir,” Debra Dixon, Dubai Chamber Choir manager, told Gulf News. The host organisation, Distinguished Concerts International New York (DCINY), first found the Dubai Chamber Choir on YouTube four years ago. “We first performed with the organisation four years ago and after our initial success, we now have an open invitation. The choir aims to participate with DCINY every two years. Previous performances were George Frideric Handel’s Messiah for Thanksgiving weekend and Maurice Durufle’s Requiem for Memorial Day. The Dubai Chamber Choir is always prized by DCINY for our professionalism and musical knowledge,” Dixon said. Founded 13 years ago, the Dubai Chamber Choir has 44 members. Membership is strictly through auditions to ensure a perfect balance between harmony parts. The members are composed of 14 nationalities with an age range of 21 to 60. Preparing for the concert in New York this Sunday was challenging considering some of the songs they would perform would only debut that night, Dixon said. “We have had 11 pieces to learn by heart in eight part harmonies, including the much-loved ‘Sleep’, which will end the concert. Memorising the pieces has been quite an undertaking. We were only given the set list in October and needed to have all pieces memorised one month before the concert. Except for one piece which is called ‘Home’, this will be a worldwide premier of this work. The composer only completed this piece one month ago,” Dixon said. Dixon said the choral scene in the UAE is going from strength to strength for all choirs that sing different musical genres including sacred, jazz, barbershop, a cappella, and different types of groups such as orchestra, multinational choirs, and single-nationality choirs. Since collaborating with DCINY four years ago, Dubai Chamber Choir has been regularly receiving invitations to perform all over the globe. “International opportunities only go to reinforce the longevity of the local choral scene. It is wonderful that international organisations appreciate the quality that comes out of Dubai,” Dixon said.